The Bishops' appeal: "May 2019 be the year of peace and reconciliation"
Bujumbura (Agenzia Fides) - 4.8 million voters are called to vote in Burundi today, for the referendum on the controversial constitutional review aimed at allowing the President Pierre Nkurunziza to remain in power for another 15 years, until 2034. The referendum is boycotted by the opposition and civil society groups, but President Nkurunziza has signed a decree that criminalises campaigns to boycott the vote. The referendum campaign took place in a heavy climate of intimidation, as denounced by the Burundian Bishops themselves in their pastoral letter published in early May, stigmatizing "the actions of some Burundians who use violence and abuse the authority they hold to oppress the freedom of expression and opinion of their political opponents. "Most Burundians live in fear, to the point that people do not dare say what they think, for fear of reprisals", denounce the Bishops, according to whom the proposal of constitutional reform goes against the same Constitutional Charter. "In fact, what is to be discussed is whether the provisions of Article 299 of the Constitution that currently governs us have been taken into consideration. This article states that no revision procedure can be applied if it undermines national unity, the cohesion of the Burundian people or reconciliation. According to what we can see, instead of uniting the Burundians, the work done and the resulting draft Constitution seem to have exacerbated the differences", the Bishops write. In 2015 Nkurunziza already obtained a third mandate in contempt of the old Constitutional Charter and the Arusha Peace Agreements, provoking a very serious political crisis, which forced 400,000 Burundians to take refuge in neighboring countries. "With the new Constitution, Nkurunziza will be able to run in the elections to obtain two mandates of 7 years each, in order to remain in power for another 14 years, until 2034"m sources of the Church in Burundi told Fides. 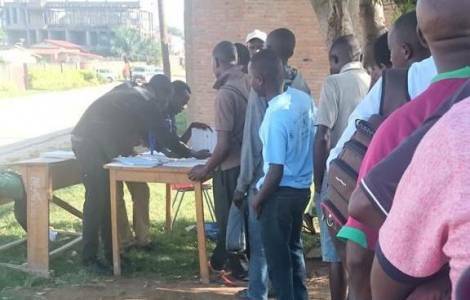 "Many Burundians have been forced to register on the electoral roll for the referendum vote. The opposition is prevented from doing propaganda to invite the population to vote no in the referendum. Under these conditions it is therefore almost certain that the constitutional reform will be approved. Furthermore, the presidential elections of 2020 risk being a farce", concludes our sources.